We love our work as Custom Framers. After 8 years serving the Denver area, we’ve had the pleasure of building thousands of picture frames and working with hundreds of clients. We love framing family photos old and new. We adore custom framing a priceless piece of children’s art. Collecting contemporary art is a passion we share with many of you so it’s an honor to ensure your art will be preserved for decades to come. At the end of the day we build squares and rectangles, but we like to think the service and care we provide is what sets us apart. 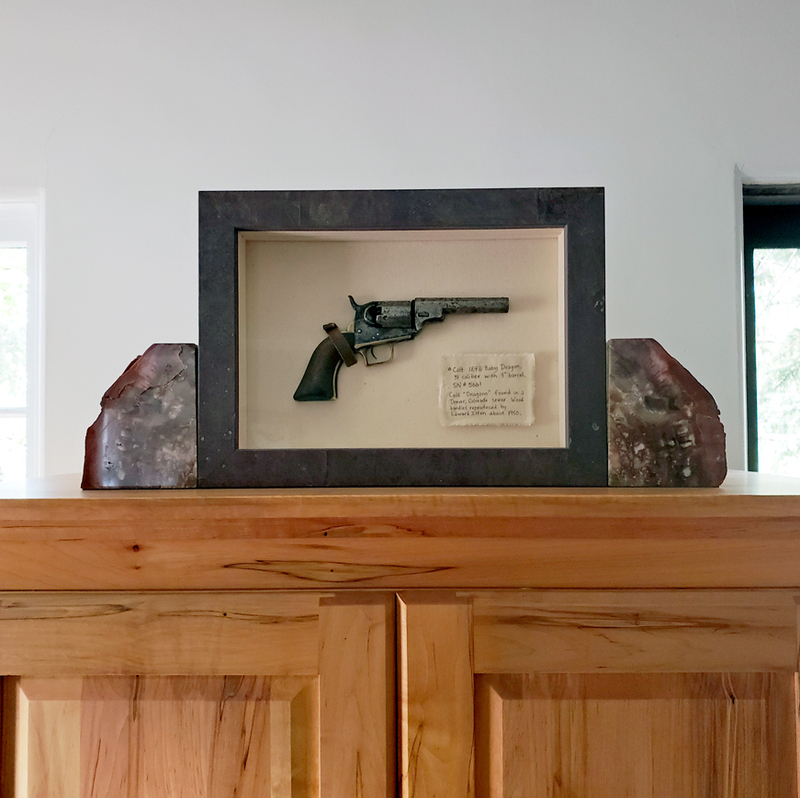 So when you bring in your treasured family heirlooms, we love the challenge they provide as well as the collaboration between ourselves and our clients. 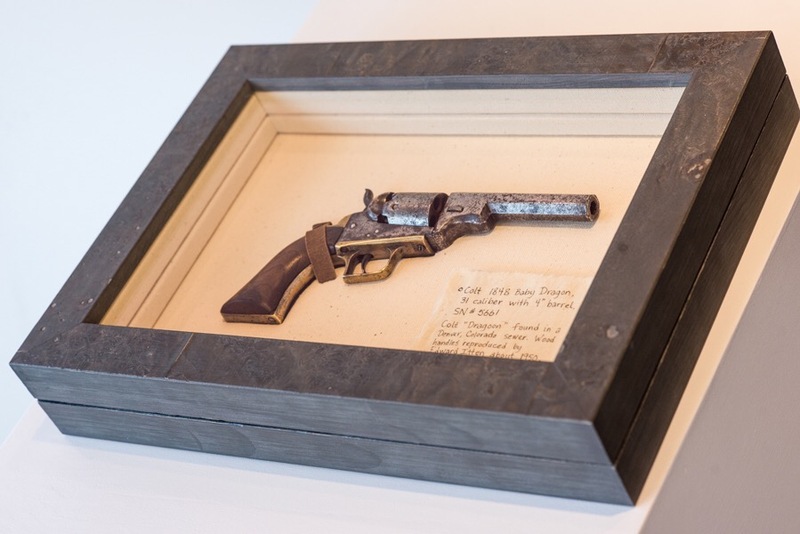 We recently had a client bring in an antique gun his grandfather pulled out of a Denver sewer in the 1950’s. It’s quite possible that gun was used for nefarious reasons and then pitched into a storm drain. 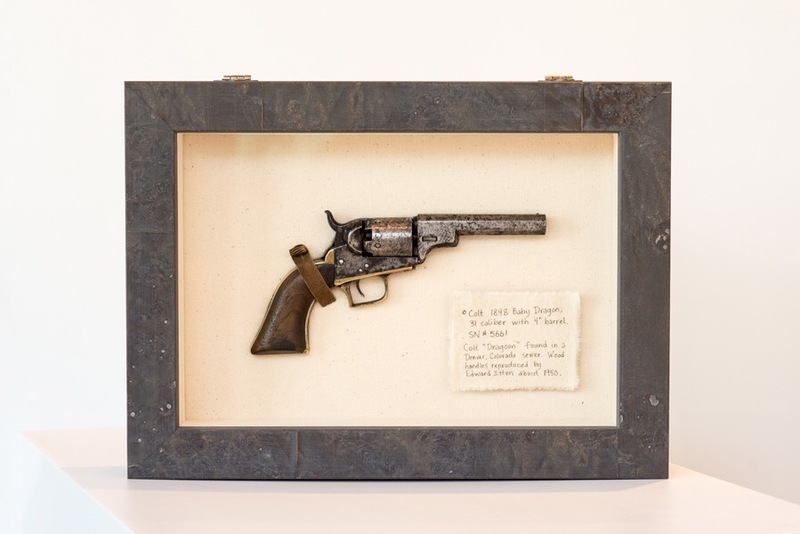 His grandfather restored the mechanisms and carved a new handle for the Colt 1848 Baby Dragoon revolver. 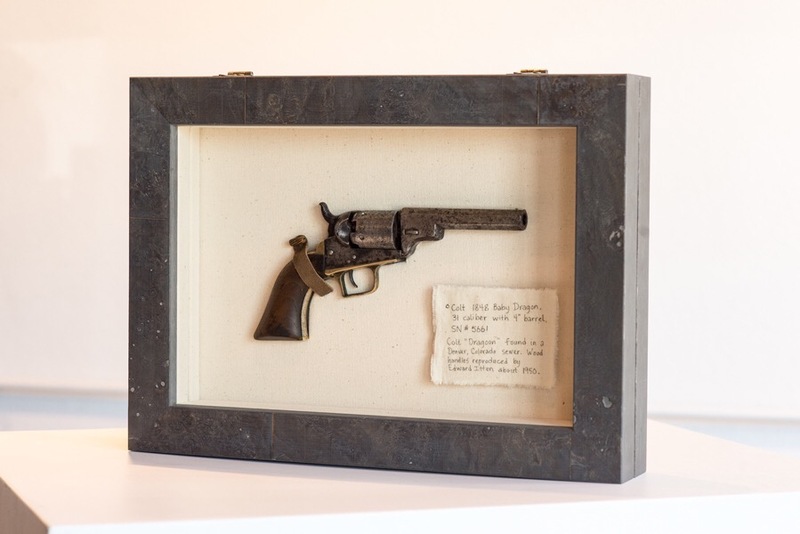 He requested a shadow box to display the gun along with with the clothe tag his sister had made years ago describing the gun. 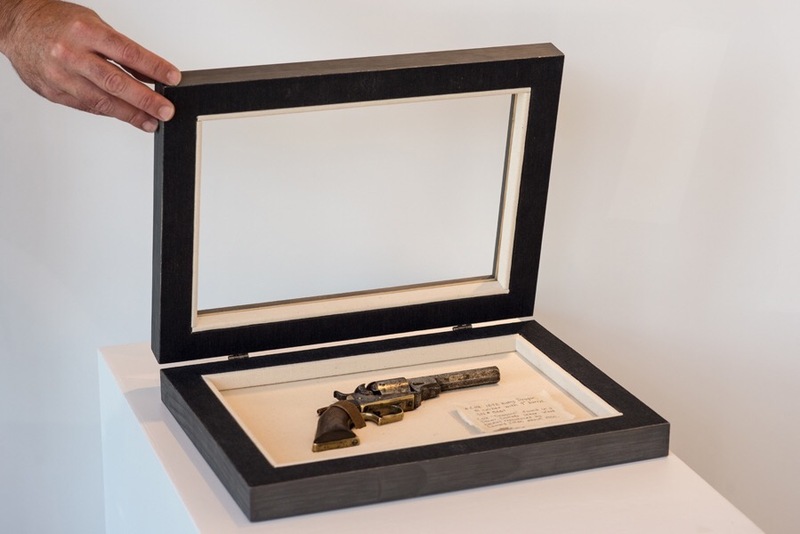 The unique request was to be able to remove the gun from the display from time to time that presented a fun challenge. The client selected a beautiful burl wood frame from Larson Juhl’s Dillon line. The mat and housing were custom wrapped with 100% cotton canvas to compliment the muslin tag. We recessed the handle and cylinder and hid magnets behind the barrel and cylinder for extra stability. A leather strap and a hand carved bone button were added to complete the closure. The two identical frames were joined and hinged back to back. Magnetic closures were embedded in the bottom of each frame to secure the lid to the base when shut. We used TruVue’s Optium Museum Acrylic as the glazing for the anti-reflective qualities as well as it’s being anti-abrasive and anti-static. We were so excited to show this to it’s owner and even more thrilled with his reaction. We love these challenging projects that make us rethink the way picture frame moulding can be used! We would love to see what you might have that will be our next fun challenge! Scroll down to see the video of Zach opening the shadow box.